what a wonderful surprise ! 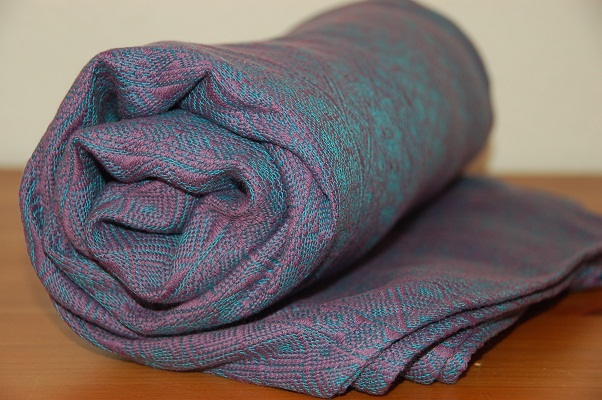 on my daughters birthday we find one of the most amazing didymos wraps online. 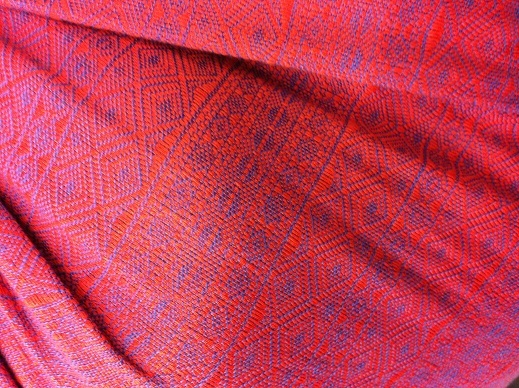 the name was suggested on facebook on the didymos page and it fits really good. olivia is really on the thicker side with estimated 250 g/m2. 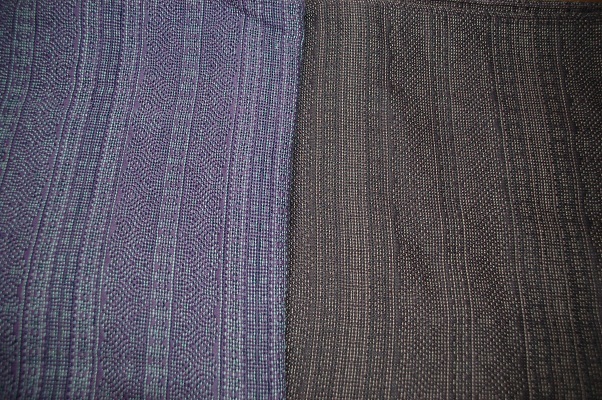 i will try to add my measurements later, but when i compare the wrap with other indios i can see certrainly a huge difference. the first thing that i noted was right after the wrap was delivered: didymos had to use additional tape to close the package. 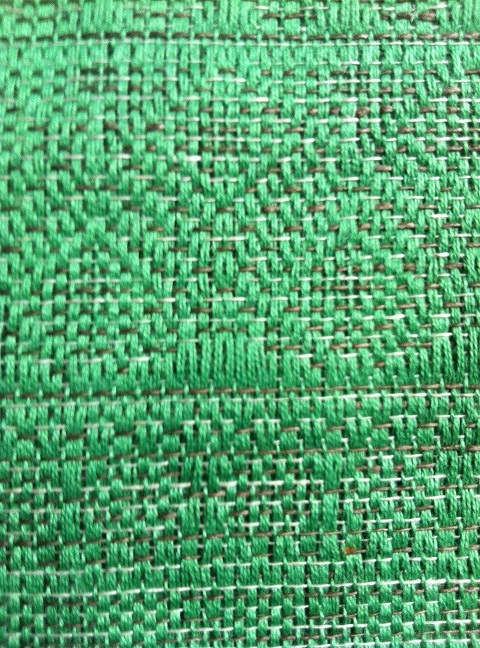 the wrap had the same green that can also be found in yew or cypress with linen (on the pic ^^ you can see cypress, olivia and yew). 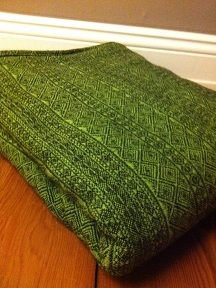 but here it is combined with thick alpaca/wool threads in a dark brown. when you look from the side you can see that this is indeed a…well, hairy wrap. 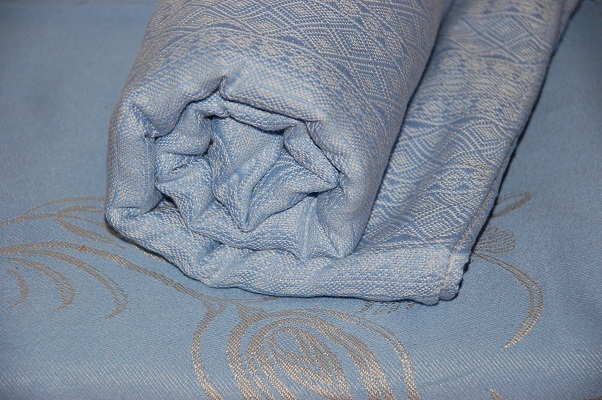 it does not feel soft at the beginning, and also after a first wash it is still on the rougher side. but i can remember that my other favorite wool indio (indio moss) did feel the same at first. indio moss got a lot of use and love and is so much softer, and i expect olivia to be the same. lately we have been on vacation and olivia was one of the wraps i took with us for wrapping my girl. she has already around 18 kg and we used it also for longer periods where she fell asleep in it, and it was always very comfortable. 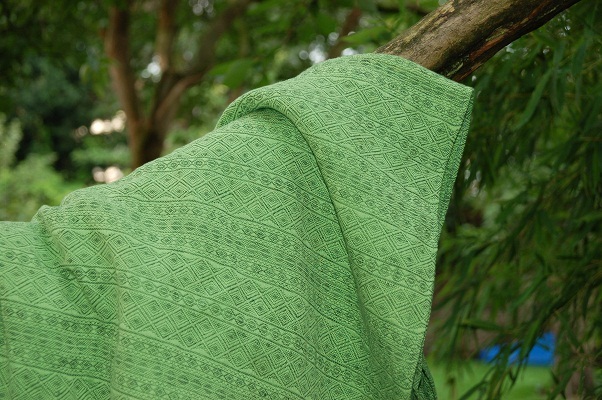 it is hard for me to admit, but i might even prefer olivia over indio yew…but wait, i will just go so far and say that olivia is our green wrap for winter. 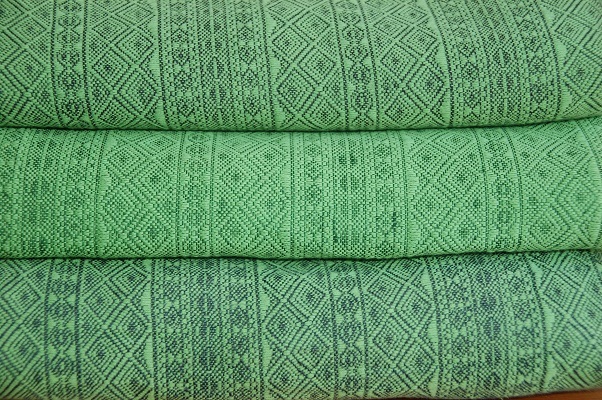 didymos released yesterday morning indio cypress with 40% linen, a wrap that they already showed at the international babywearing conference in the usa. 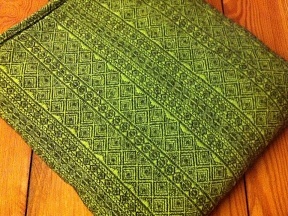 and for me as a green wrap lover it is absolutely perfect. 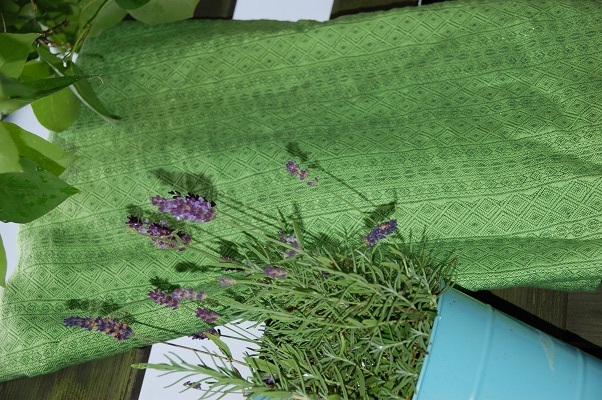 i love the bright cotton green combined with a beautiful dark green linen thread, i love the pattern,…and let’s see if i love the thickness/thinness as well. 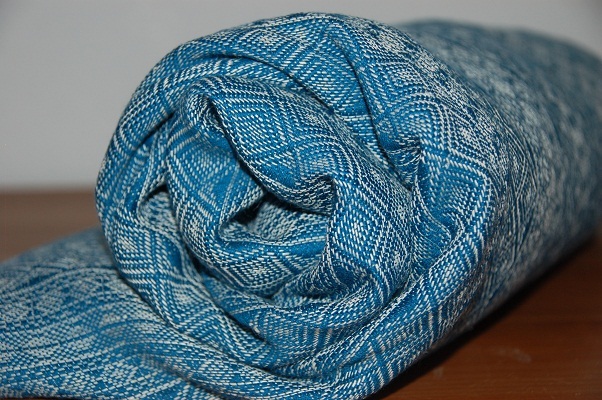 i needed a break, but now i have a lot of beautiful new wraps waiting for a review and i think i will start with one of the latest limited didymos releases: indio lohme with 40% linen. 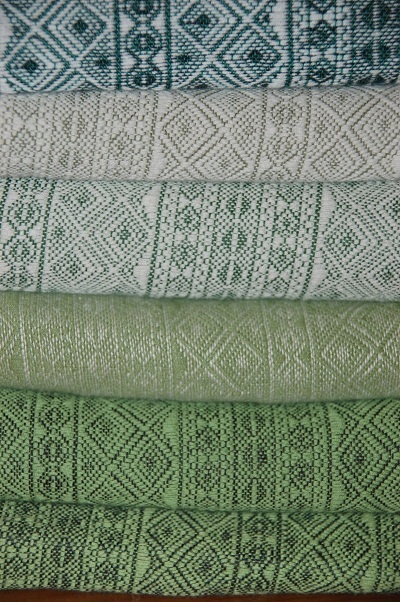 lohme was woven for the german shop trippel-trappel in memory of one of the most beautiful islands in germany – ruegen. lohme is a community on ruegen and the colors of the wrap remind the owner of the shop of the island and the wonderful time she has already spent there (and will spend there in the future). 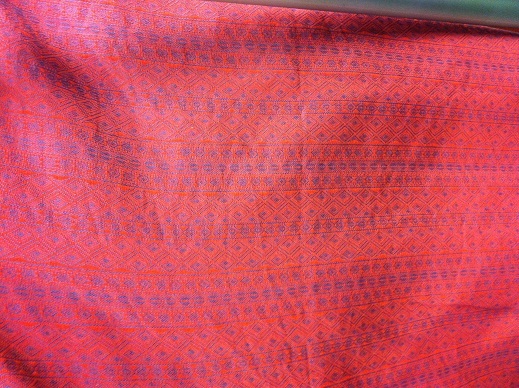 on the picture above you can see lohme in between indio yew with 50% linen and skanderborg fish with wool. and here starts some confusion. 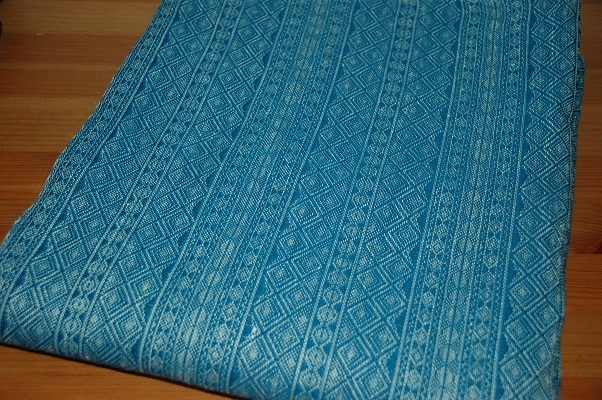 trippel-trappel was given the weight from didymos for this wrap as 210 g/m2, which would have been a nice medium weight indio with a tendency to the thicker side. 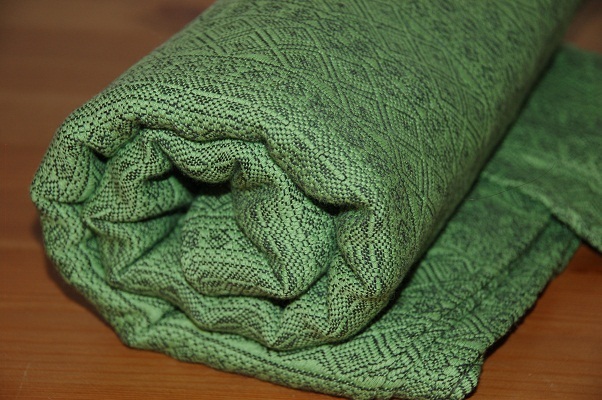 when i received the wrap i was first of all flashed by its color (it has the same green as skanderborg fish), but when i took it out of the box i was surprised – this wrap is really really thin. but never judge a wrap before the first wash, so i threw it in the tub. on the other hand a thin wrap will not come out of the wash as a thick wrap…the weave will be more dense, it will be softer and even floof up a bit. this has all happened and lohme was already very soft and moldable, and i guess it will need no time breaking in. but it was still ridiciously thin…i even asked some friends to measure their wraps and we always got numbers in between 170-181 g/m2. as a scientist i know that scales may vary, and that you need differnt persons weighing and measuring the same wrap on the same scale several times. but this wrap will stay very thin. 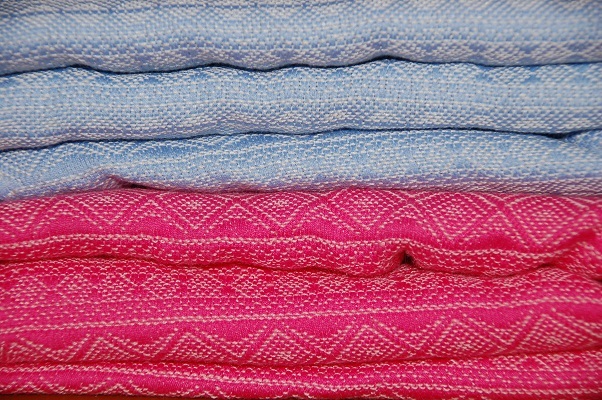 according to didymos and the shop it is hard to receive exact measurements and they are always around the given number. i totally agree to this. 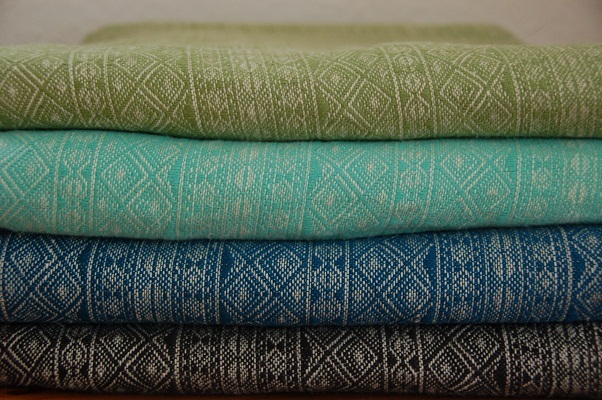 but here is a really significant difference and it makes me wonder if didymos is actually weighing and measuring their wraps…or are they just guessing ? i have to admit that this will leave a bad feeling regarding future releases and the given g/m2 when i’m trying to decide if the wrap might work for me and my toddler. but for lohme are obviously enough thin wrap lovers with smaller babies out there. 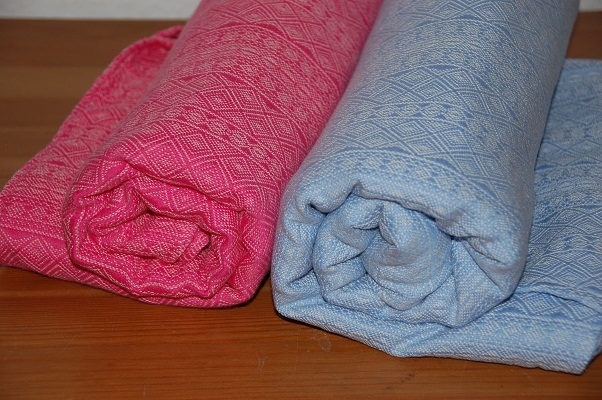 and i’m sure that they will love the wrap, especially in warm weather. this is indio petrol with 40% hemp v2. 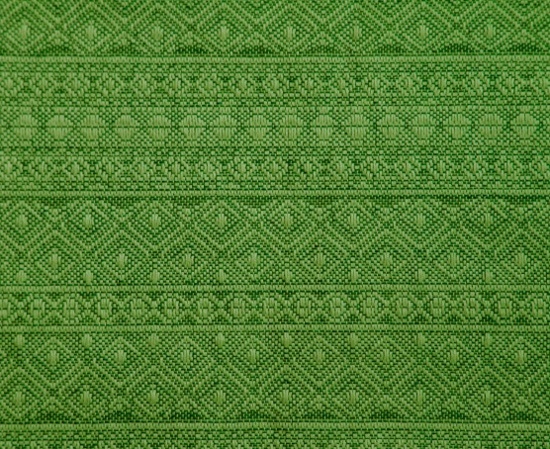 the first release with a whiter hemp was released in russia only. but there was also a huuuuge demand and so many people kept begging for more petrol hemp that didy released another batch with a more creamy hemp. this wrap arrived today and it is so my color. normally i always wash wraps before i use them, but i couldn’t wait to give it a first try. 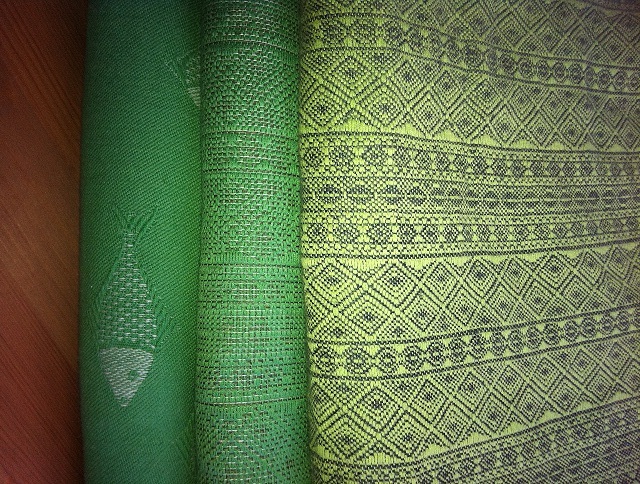 together with the other colored hemp indios: erba, grass, petrol and anthrazit. the use of complementary colors have an amazing effect on the wrap. depending on the light and the point of view it shimmers more orange or more blueish. 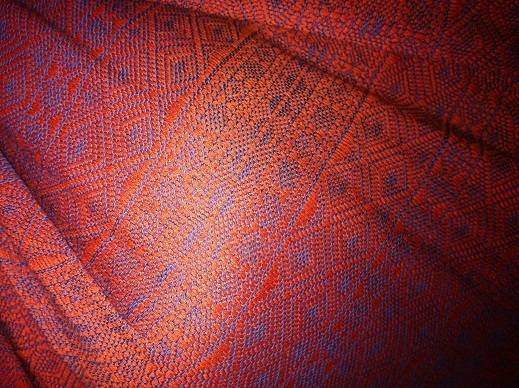 and as you might know i looooove the combination with orange and can’t wait for some comparison shots. what a surprise ! 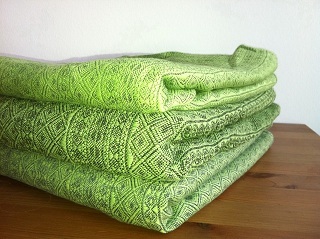 as a green lover i was more than just excited to see todays new release: indio pinus with 30% alpaca. 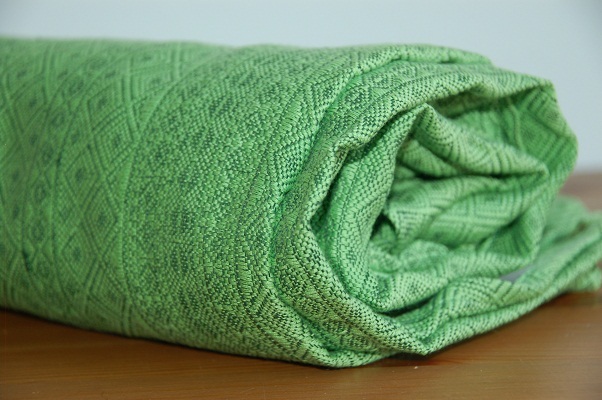 this wonderful wrap consists of 30% anthracit baby alpaca wool and 70% green cotton threads. 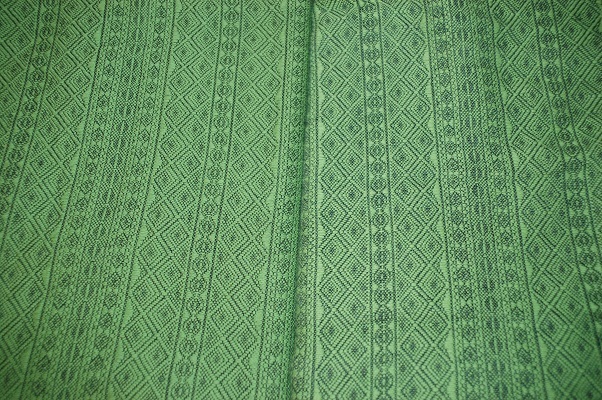 it reminds me a lot of 50% linen indio yew and i cannot wait to make some comparison pics with both wraps side to side. 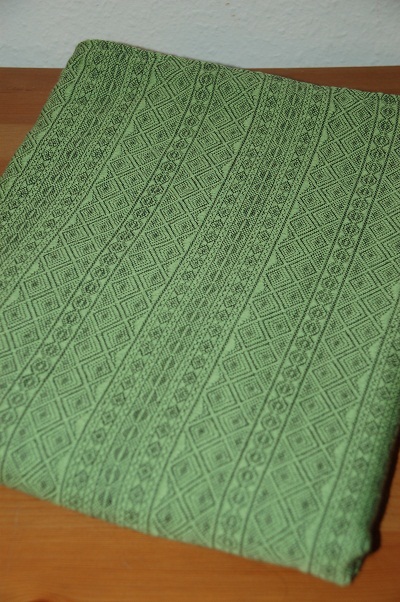 didymos said that it is comparable with indio zyklam alpaca and as i know that this thin wrap still works great with my nearly 3 year old kid i’m more than optimistic that it will be a great wrap for us two green eyed girls. and yes – a lot of english speaking people are having a giggle at the name. but let me tell you, that the ‘i’ in pinus is a bit longer pronounced and the ‘u’ is slightly different too…so there shouldn’t be any confusion…hehehe. this tri-colored indio is the younger brother of indio lavanda. 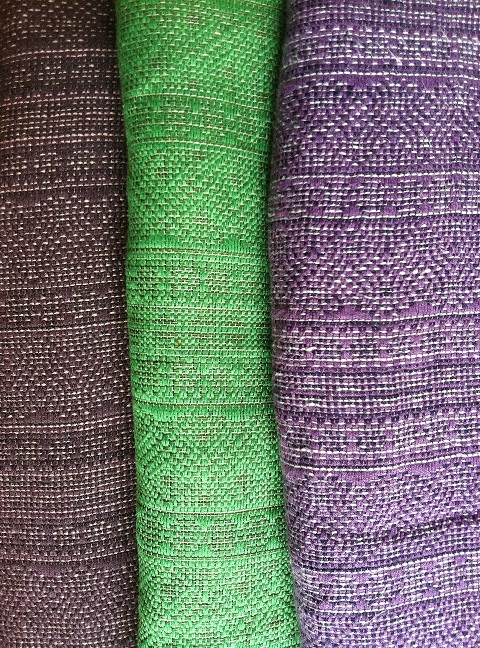 indio purple is made of 70% purple cotton and 30% light pink and dark anthracite baby alpaca wool. right out of the box is already soft and it will soften up even more after the first wash. the color is really hard to capture on pics and i’m not totally satisfied with these pictures as well. 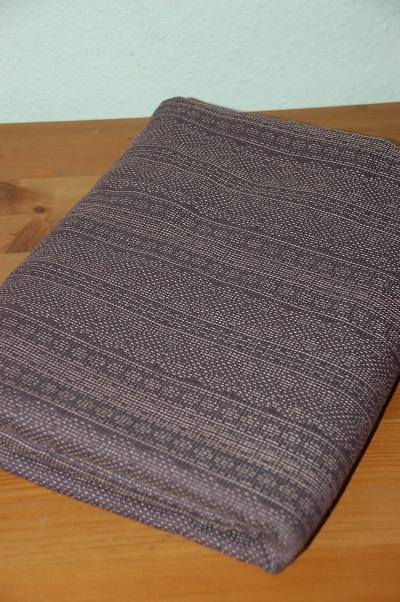 it is a nice, dark and elegant wrap and it really depends on the angle you are looking at it and on the light. 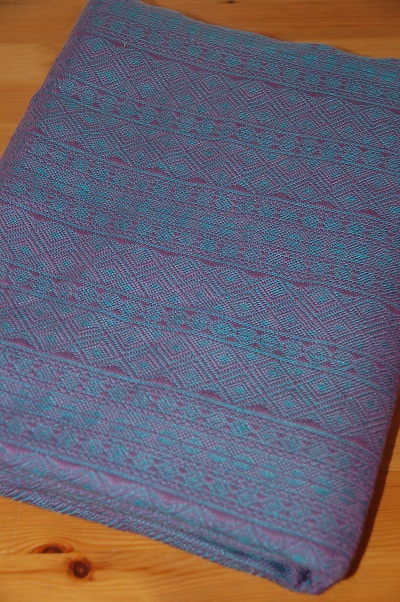 the purple is not that prominent like in other purple didymos wraps, but more toned down due to the anthracit alpaca wool. 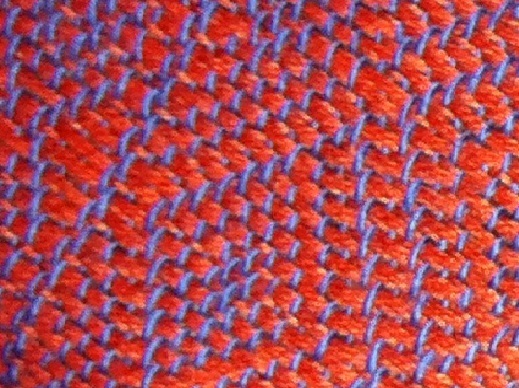 this year didymos is really experimenting with different fibers and fiber combinations. 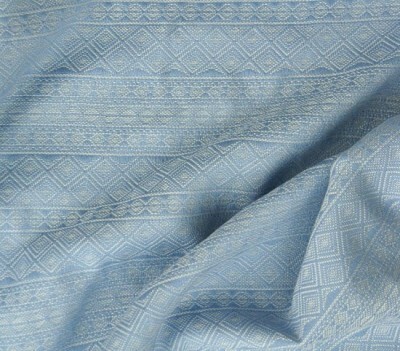 today indio eisblau with 70% ice blue cotton / 15% silk / 15% wool was released. it seems to be on the thin side, but i guess it will be wonderful – at least for smaller babies, but who knows, maybe it is surprisingly comfortable for older kids, too. after the first wash the wrap is even softer than right out of the box. when it is wet you will notice the typical silk smell (some are loving the smell, some don’t), but when it is dry is is just pure fluffy heaven. even when you wash it by hand in the tub it will lose some of its width, but it has more stretch than tussah silk fish or nino tussah, so i don’t think that it will be a problem. 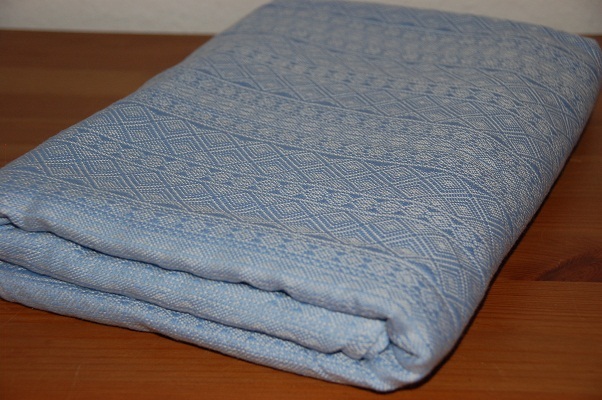 i just wrapped my nearly three year old daughter in it and it was crazy comfortable. i will give it another longer try for one of her naps in the following days. surprisingly it seems to be post-wash due to its shrinkage in width even more dense than indio zyklame alpaca (164.47 g/m2 compared to 180.29 g/m2). this was one thing that i wasn’t expecting – but i’m quite happy about it. on the pic above ^ you can see how it fluffed up after the wash in comparison to indio zyklame alpaca.